NerdWallet, a San Francisco-based financial recommendations startup, frequently makes best-places-to-work lists, such as the Bay Area News Group Top Workplaces, year after year. But what does it take to build a company that people love to work for? 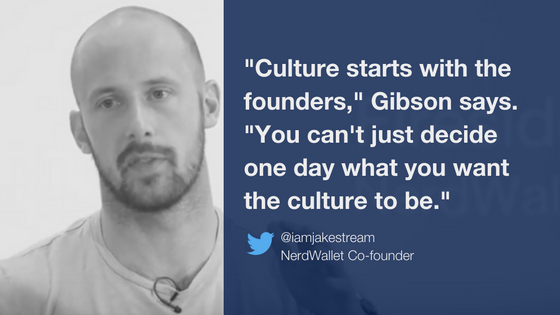 In his recent talk at RocketSpace, Jacob Gibson, co-founder and former COO of NerdWallet, discussed the ins and outs of building a company culture worth touting. He also discussed the importance of hiring the right employees early on and its effect on company morale. Here's what Gibson had to say about founding early-stage startups with a winning culture, along with three key takeaways every startup founder should keep in mind when building a team. "Culture starts with the founders," Gibson says. "You can't just decide one day what you want the culture to be. It's how you act at work, how you treat people's decisions, and how you treat people's work. All of those things are your culture, whether you like it or not." Dictating a company culture starts with dictating your own behavior. Determine what kind of company culture you want to build and whether or not you, as a founder, are living that definition. Then, build it into every process, from hiring and training to feedback and firing. "Any decision you make with the company has to tie back somehow to the culture," he says. "'Cool' doesn't matter. It doesn't define your culture," Gibson says. NerdWallet was founded by two guys who had just left Wall Street. Gibson says he and co-founder and CEO Tim Chen started out wanting to build an "anti-Wall Street, anti-investment bank" culture, but learned the hard way that it's not about whether or not you have a ping pong table or get to wear t-shirts to work. Knowing your values helps keep everyone in your organization on the same page. Mindfully build your values into each decision and over-communicate the connectivity of values to action. "Every time Tim, our CEO, gets up in front of the company to talk about anything, he ties it back to the company culture — the values, the mission," says Gibson. When someone gets promoted or congratulated for doing a great job, tie it back to the mission and values. When someone is fired, tie it back to mission and values. When the company makes a strategic decision, tie it back to missions and values. That is how a culture is built and maintained. Hiring well makes running a business so much easier, and hiring poorly can be a time sink. Gibson suggests that above all, founders think strategically and thoroughly about their hiring process and decisions. He believes that 90 percent of a startup's problems can be traced back to hiring. "The hardest people to fire in an organization are the B+ players," Gibson likes to say. They're the ones doing the job and checking off the boxes, but they take tons of time to manage and require lots of handholding to get their job done. These B+ players just barely meet the quality threshold, and founders tend to keep them around for too long, because they don't want those assigned tasks back on their plate. In the end, though, keeping B+ players around demotivates other teammates and puts a strain on resources that could be used more effectively. "Be more thoughtful up front about exactly what you're trying to hire [for]," he recommends. "Find people that don't need you to make decisions for them, who can take over an entire function... Spend a lot more time on the hiring process to find the person who's not just checking the boxes, but is ideal."